Yesterday I was considering whether or not I should take up the 23andMe $99 (+ $60 subscription + $67 postage) offer on DNA testing. I had concerns about the "personal genome subscription", but I was tempted. With a bit of egging on from Carole (both in comments and on twitter), I decided that the best way to stop the temptation was to give in to it. I bought the kit! The purchase process was simple enough. So far so good. Don't get me wrong. I still don't like 23andMe's pricing model. Not at all. Thank you to Bobby for the link to a discussion forum on the topic. It seems I'm not the only one. If they maintain this new pricing model, I think 23andMe will seriously lose value to genealogy users - starting one year from now when this first batch of people on the new pricing structure decides whether to keep or drop their subscription. The rest is a great adventure which I'm very excited about! Should I jump in the gene-pool? Input needed! OK, I don't have much time to make up my mind because 23andMe's $99 (plus $60 plus hefty postage) deal ends today! I've been too-ing and fro-ing in my mind about whether I should do it. The main issue for me is the conditions around the "personal genome service". Under the special offer, you have to pay a subscription of $5/month for a year. This subscription gets you access to any updates, and emails about new matches for a year. Did you sign up? Did you read the fine print? "If you cancel your subscription after the one year commitment, you will not show up in new relatives Relative Finder list nor will you see them in yours." All credit to them for a quick and unambiguous reply, but the fact remains, no matter how big 23andMe say the database is, you don't necessarily have access to that many other people nor they to you. I would be much more comfortable with a model similar to most genealogy sites where you could see other matches but only initiate contact if you had a current subscription. However - and this is where I'm underinformed and would appreciate input from someone knowledgeable - it seems you can download your raw data and presumably use it elsewhere. From what I can see that's pretty straightforward so far as the male line is concerned and if I thought I could convince my Dad to give me a vial of spit for Christmas then I think I could live with that. But, if it's me that does the test is there anywhere that I could use mitochondrial and more particularly the "relative finder" results? I am lucky enough to have access to a real family history treasure chest. Over coming weeks I plan on sharing its contents with you as I rediscover what's inside. 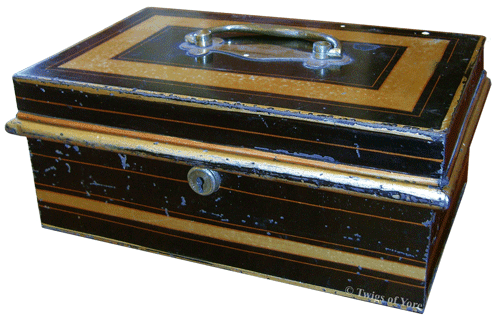 I was recently asked if the "treasure chest" pictured above is the actual container that holds the documents I'm describing. Yes, it is. The dimensions of the box are near enough to 25cm x 15cm x 10cm. There is a keyhole on the front, but no key. It's lucky the box wasn't locked when we got it! The next item I find in my treasure chest is an obituary, from an unknown newspaper. The date is not printed on the item, but it bears the handwritten notation "2/8/56". The subject of the obituary is Arthur Milne Lee, my great grandfather. Like most of the items in this treasure chest, I noted the family details when I first saw it all those years ago, but did little more than that. This document has quite a bit to follow up on. I have evidence that at least two other Lee family members worked for Arnall & Jackson - a firm of printers and stationers. That is definitely a company I would like to find out more about. There is no mention in the clipping of Arthur's involvement with the Freemasons. A resident of Oakleigh for over 70 years, Arthur Milne Lee passed away peacefully at his home, 12 Rugby road, on Thursday, July 19. Mr Lee was survived by his wife, Jessie, daughter Edna (Mrs F. Orr), sons Leslie, Fred and Jack, and eight grandchildren. He was predeceased by a daughter, Phyllis (Mrs R. Davenport). Mr Lee was born in Colac and came to live with his parents in Oakleigh 74 years ago. Edu­cated at Oakleigh State School, he was presented with the Mayor's prize for the dux of the school in 1891. (The late Cr. J. Davey was Mayor at the time). As a youth he played cricket for Oakleigh and won the tro­phies for the best batting and best bowling averages in the one season. Early in his career Mr Lee worked in Oakleigh with Mr Lucas and Mr T. G. Newton. In 1901 he joined the well-known printing, publishing and station­ery firm of Arnall & Jackson, of Melbourne. As a traveller, his connections were mainly with municipal authorities. He was probably more widely known among Victorian Town Clerks and Shire Secretaries than any other commercial personality. He was still employed by the firm at the time of his death. Following a service at 12 Rugby road by Rev. Ball, of the South Yarra Church of Christ, the large funeral cortege left for Springvale Crematorium on Friday, July 20. If you have a connection with this family, then please get in touch with me via comments or use the email address on the "About me" page. I would love to hear from you. Can you help date this photo? Here are six strapping men that I would like to date. The man at the back right in particular has caught my eye. Before you jump to conclusions, remember, I am a married woman and this is a genealogy blog. The only type of dating I am interested in is finding out when this picture was taken! You may be able to help. The photo comes from the collection of another French family researcher, who has given his permission for me to post it here. He's as keen to find out about the man at the back right as I am, as this man may be our shared ancestor. Click the picture for a closer look. The photo's owner is confident that B. French is his ancestor, Albert Edward "Bert" French (1887-1958). The photo was in Albert's collection and was first seen by other family members after his spouse's death in 1983. The writing was already on the photo at that time, but it is not known who made the identification, or when. We want to work out who "J. French Snr", standing at the back right, is. There were four generations of the family named James French in Victoria, Australia. There was only one John we know of who is believed to have died before the likely time period of this photo, and no other known J names. We think this is most probably one of our James Frenchs. But which one? The most likely candidates, given the apparent age of Bert, are James Henry (our shared ancestor) and James Thomas. 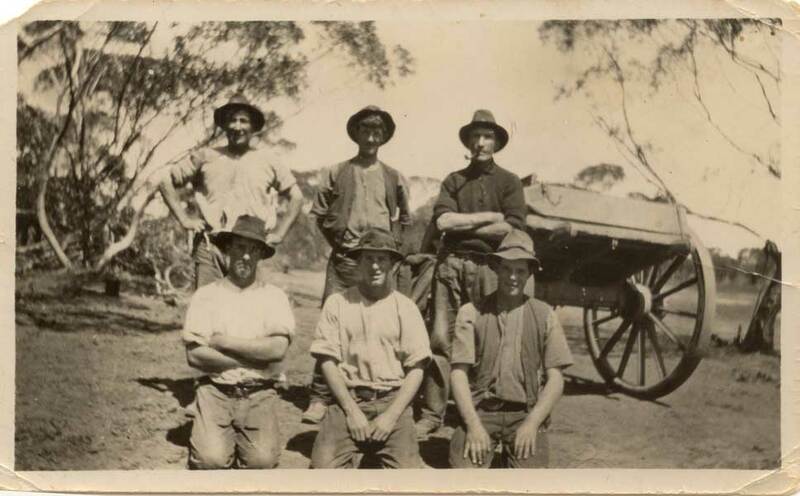 The family lived in the Avoca, Victoria, region which is around 250 km (150 miles) from Ouyen, Victoria, where the photo was taken. Do you know any of these men? Have any tips or suggestions for dating the photo? Perhaps you are a Trickey or a Marshall descendant who is just as interested in this photo as we are? Even if you stumble onto this page a long time after it's publication, please get in touch! Leave a comment, or contact me via my details on the "About me" page. The photo has been more widely circulated among French family members for comment. As a result, P and H Trickey have been identified as Percy (c1903-1937) and Harold (c1904-1936). Given that they appear to be older than 10-11 years of age in the photo, this dates the photo after 1915, when James Henry French died. We believe that the man in the photo is therefore James Thomas French. Yesterday I attended the Unlock the Past History and Genealogy Roadshow here in Canberra. I had been looking forward to this event, as it was a rare (for me) chance to get out and among people while in pursuit of my family tree. I not only took the day off work, but took the evening off family! That's actually kind of momentous for me. My day started with a minor hiccough. When I looked at my map I discovered that the venue was not the hotel I had been thinking of. It was ten minutes further away from home. On arrival, the car parks were already full and it took me a while to find a suitable parking spot. I walked into the first session mildly late, and feeling flustered. First up I had a choice of hearing Rosemary Koppittke talk about FindMyPast.com.au, or Cora Num discussing "Irish research in the electronic age". It was a difficult decision, but I chose the FindMyPast session. 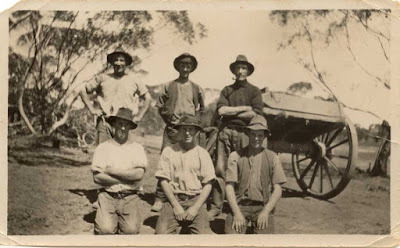 I have recently taken out a monthly subscription to FindMyPast.com.au in order to give the site a proper chance. I think that the search tips Rosemary provided may just make all the difference for me. I hope that FindMyPast will add more information to their site on how to search effectively there. Next up was a choice between Louise St Denis with "Can I Learn Everything I Need About Records and Research Strategies Online? Genealogical Education from a Distance..." and Tom Foley with "Treasures of the National Library of Australia". In her blog post, Shauna Hicks expressed surprise that so many Canberrans attended the National Library session as we would "almost live at the library". Before I had little children that was true for me. I can't speak for all attendees, but I was interested in this talk precisely because I spend so much of my research time at the Library. Imagine if I missed out on something fantastic that I could have accessed so easily? After a short break the late afternoon sessions began. It seems that a choice between Dan Lynch, the author of Google Your Family Tree and the Heraldry and Genealogy Society of Canberra (HAGSOC) was no choice at all. The HAGSOC speech was cancelled as the overwhelming majority of attendees chose to sit in on Dan Lynch's talk. And no wonder. Dan's style was immediately engaging, and he conveyed his information clearly. For me, Dan's speech was the highlight of the day. Although this session only covered the basics, and I thought I had the basics pretty well covered, I still picked up plenty of ideas. I bought a copy of the book between sessions and look forward to making my way through it and trying things out for myself. The next session presented me with another difficult choice: Shauna Hicks with "Archives you may not know - but should! ", or Cora Num with "How Did They Get Here? : Locating Shipping and Immigration Records". I decided to hear Shauna speak - but not before dashing out to my car to get a jacket, as the air conditioning was uncomfortably cold. Shauna spoke well and introduced the audience to archives large and small, and portals for finding out about them. Dinner time arrived. I was pleased when Shauna joined me as I had "met" her on twitter but not in real life. It was good to have a chance to meet her in person. Also joining us was one of the very few other younger attendees - who, it turned out, reads this blog! Although I know from the page statistics that a few people out there must read this blog, it still came as something of a (pleasant!) surprise to meet one of them. The evening sessions held more difficult choices. Either "FindMyPast UK and AU" with Elaine Collins and Rosemary Kopittke or "I Found It Once, Why Can’t I Find It Again!" with Louise St Denis. Then, either "Google Your Family Tree: Images and Video" with Dan Lynch or "ScotlandsPeople: the place to launch your Scottish research" with Rosemary Kopittke. As I had already heard a discussion of FindMyPast.com.au, I went to Louise St Denis' session. It was good to see that the majority of attendees in that session already cited their sources. Finally came a choice between hearing Dan Lynch again, or learning about ScotlandsPeople. It was another hard choice, but Dan Lynch had whetted my appetite for Google tips! This time I'm not sure I picked up quite so much. In some cities, I gather, the Roadshow extends over two days and Dan Lynch gives four different speeches. As the population of Canberra is smaller, the Roadshow here was a one day event. This second speech was more of a whirlwind tour of the three other speeches and, although I enjoyed it, I think I would have preferred to hear a full speech on one topic. During the day I bought a few other books, and was lucky enough to win one of the early registration prizes. I also signed up with HAGSOC again, after a lapse of 15 years. Aside from the chilly air conditioning, the only other thing that I would have changed about the organisation of the event would have been to provide water and tea/coffee facilities for attendees, rather than having to purchase drinks from the bistro. In the past year I've managed to get to the library for research just twice. Imagine how excited I am to have registered for Unlock the Past's History and Genealogy 2010 Roadshow, in Canberra next Monday. The program looks great, with two speeches to choose from at each of six speaking sessions. There is something of interest to me at every session. In most cases I will have a very hard time deciding which to attend. If only I was two people! I've just had a week away on a family holiday. A good time was had by all, despite the cold and rain. Last time I went away, I made good progress on data entry in the evenings. This time, I didn't get quite so much done. I'm now trying to catch up on correspondence with my genealogy contacts, and all the data entry from new finds.